I just have time for a quick update on my progress working on my spaceman before I dive back into more texturing. 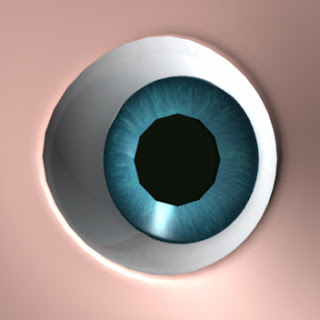 I thought I'd go over my process to paint a realistic eye texture and show you the result as rendered out of Maya. The result below is entirely using a painted colour map and I will continue to tweak the material a little but for all intents and purposes it is pretty much ready for use in a final render (I still need to poly tweak the edges of the pupil so that they are more of a round shape). This is the final result as rendered from Maya. Lets start by showing you the basic UV layout of the eye. The way the eye I'm working on has been unwrapped is a little bit unconventional, but it will work fine for my purposes. As you can see the eye has been unwrapped with the seam running around the hemisphere of the ball with the iris at the pole. The pupil is the small circle off to the top left of the UV. It was modelled as a separate piece of geometry extracted from the centre of the iris, then pushed back into the ball and scaled up slightly to ensure that none of the inside of ball is able to be seen through any gaps. To paint the eye itself, I first started by blocking in the basic colours of the texture. White for the Sclera, blue for the Iris, and black for the Pupil. All pretty basic stuff, but I think this is a very important step to get the basic colour scheme nailed down so that you don't spend heaps of time painting detail only to find the basic colours you are using don't work together well. I always start any painting, illustration, texture this way so that I can quickly see if the overall scheme of colours are working well. I highly recommend this way of working, as it really does cut down on the amount of fix up work later in the process. Alright once the basic colours are all blocked in and you are happy with the overall colour scheme, now begins the fun part! I mentioned an earlier post that I always use reference material when painting. For this particular character I had collected some really high resolution photographs of eyes and I wanted to include some of the really amazing detail that you can see when looking at the Iris up close. To get more interest into the Iris rather than a plain flat blue colour. I painted in some variation to the colours using a soft edged brush, set to a low opacity. Painting using a low opacity setting on the brush (usually between 5% and 25%) allows for gradual blending and build up of colour, so that you don't get the nasty banding when painting at 100% opacity. Using the detail ideas I had got from my gathered reference, I added in a dark blue ring that runs around the Iris, a lighter more subtle blue/green band in the centre and several patches of very bright aqua/green to create little islands of colour in places around the Iris. When painting anything that is organic in origin you always need to try and paint randomly. This is easier said than done unfortunately. Practise is the only way to get good at this. The best you can do to start with is try and look for patterns in your brush stroke and eliminate them as they occur. As you get more practised at this you will find that the patternation will appear less and less often in the first place. to get the filaments of the iris I painted several layers of squiggly lines that run from the centre out to the edges of the Iris in a spoke like pattern. Again when painting your need to keep these as random as you can so the best way to do that is to paint each filament by hand rather than painting a patch and copying and pasting the layer. It's a bit of a pain I know but spending the extra time here will pay dividends later to the overall effect. Each of the layers of filament's where painted in a different colour and also had varying amounts of patchiness and size. The first two layers are pretty much uniform and are there to get as much coverage as possible. 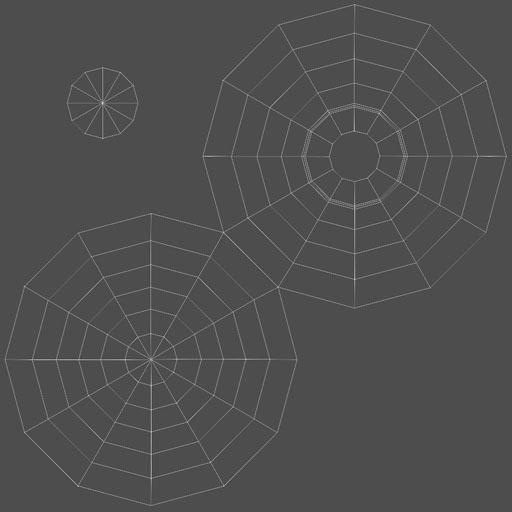 The next three are included to get a little more variation and randomness to the filaments. Its also interesting to note that the last layer of filaments that I painted was in a dark blue colour almost black. This layer helps to add depth to the eye creating the shadows between some of the lighter coloured filaments. Lastly a layer with a dark blue ring around the outside of the Iris helps it to stand out a bit more from the Sclera by creating more contrast between the white and the blue. 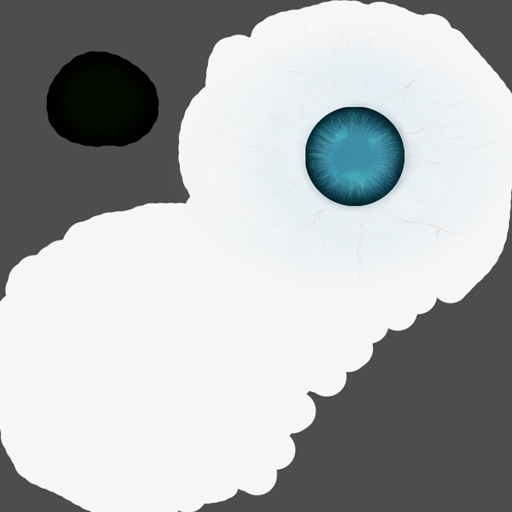 The Pupil is basically a black splodge of colour with an extra layer that has been painted up using low opacity. The extra layer adds in more tones of green and dark blue and is basically there to vary up the black as I don't want any areas of flat colour in any of my textures. You don't find areas of flat colour with no variation in nature, so why have it when painting? Lastly the Sclera needed some detail and variation, again using a soft edged brush set to a low opacity I built up a ring of blue around the iris that bleeds into the white of the eye. I had also noted in the reference material that the white part of the eye has areas of a blueish hue that indicate regions that are thinner and therefore allow the inner colour of the ball itself to show through to the surface. I tied to include a little of this feeling into my texture by painting a very low opacity layer of blue in a circular pattern over the front of the eye. 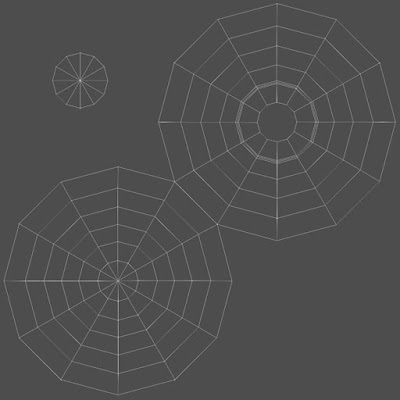 Also present in the reference material was a network of spiderweb like veins, so I have painted a random pattern of veins of varying thickness and density across the front of the eye that all radiate out from the centre. It is work noting that all of the layers of detail have been further blended in together in the final image through changing the opacity of each of the layers painted in Photshop. Breakdown of paint layers from Photoshop, combined to create the finished texture map. Here is the final painted colour texture map. I hope that you have found this post informative, as always I intend to continue to update my progress on my character as each of the stages get completed.